i'm pretty sure any of you could figure this out on your own, but i just love my new driftwood wind chime so much that doing a tutorial was a good excuse to share it with you!! :) this is also a snapshot of my new painting nook, isn't it nice and bright? 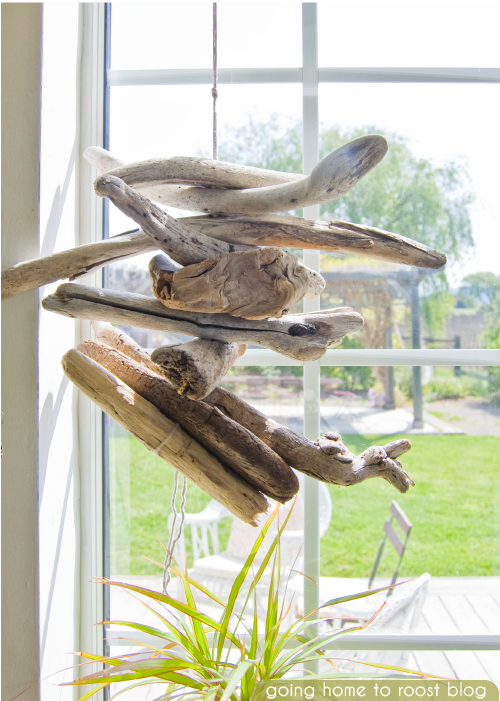 1. some pieces of driftwood (this image is from stair lodge supplies, and they're for sale!). >>don't live near the beach? check out etsy supplies for driftwood! 2. some cotton twine (shop on etsy for twine here). 4. a small drill bit (just big enough for the twine to pass through twice). 1. drill a small hole (just big enough for the twine to pass through twice) in the middle of each of your driftwood pieces. 2) fold the twine in half and thread the folded end through each piece of driftwood (i found threading the folded end through a bobby pin and then using the bobby pin to go through each hole worked well). this will create a loop at the top and two strands at the bottom. 3) take your two dangling ends and tie them up and around the last piece of wood and make a double knot. either clip short or leave hanging. 4) hang your new wind chime from the loop at the top! awesome diy! :) i will definitely be trying this. Love, love this! I often forget that Toronto has a beach and that it is within walking distance! Now that the weather is warmer, I’ll make a point of strolling down there to look for raw materials. Thank you for sharing this DIY project.